Roman Gladiator Dagger Knife with Scabbard | BUDK.com - Knives & Swords At The Lowest Prices! Step back in time as a Roman Gladiator with this highly detailed dagger! Equipped with a stainless steel blade with a satin finish, this knife is an accurate reproduction of the daggers used by Gladiators in the early 2nd Century BC. The blade offers etched scrollwork designs. The handle is constructed of cast metal with intricate gold designs. 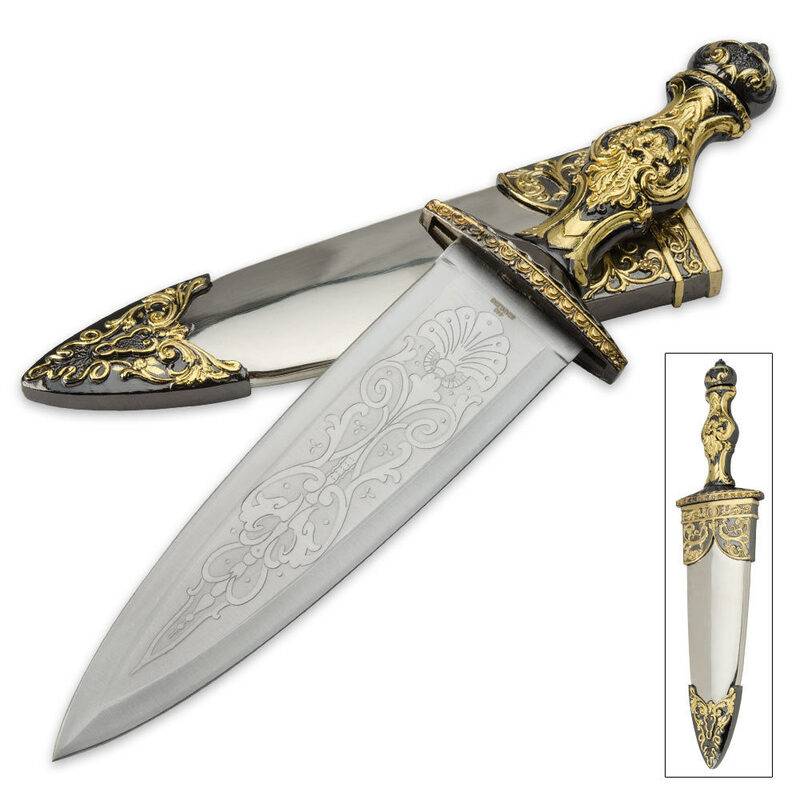 The included scabbard is stainless steel with gold cast metal scrollwork designs. The blade is sharp and has a stunning cast metal handle. The scabbard is plastic in the center with cast metal at the top and bottom. The blade has pretty scroll-work engraved in it. With a little work the knife will be great. I do want to add though that it is not meant for use. So i saw this dagger and i had to have it. Its at a great price and is very well built. The one and only problem i can complain about is the gold trim on it is painted. This is fine and expected with the price but they just didnt do a good job tracing over what needed to be gold. May not bother others as much as me. 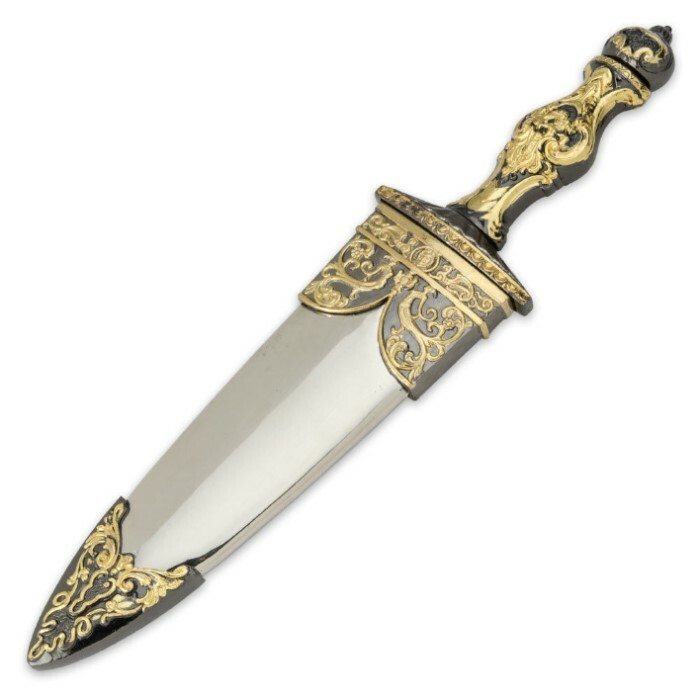 Saw an exact model of this dagger on a movie about ancient Rome the other day. 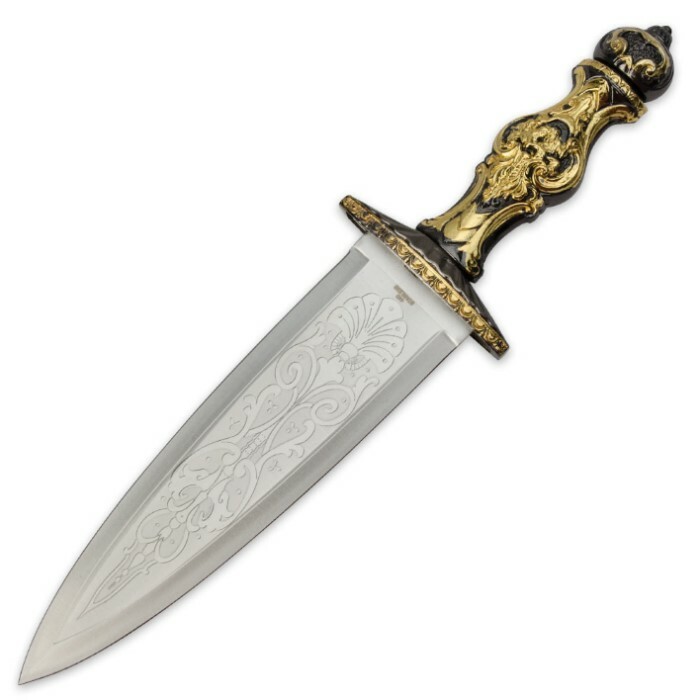 It is historically correct, feels and looks more expensive than it is at $17.00, comes with a semi sharp blade, gold finishing on the handle and scabbard, and has good weight and balance to it. The photos do not do it justice. Also comes in a nice presentation box. Sure to sell out, and will make a nice gift for any history buff. A very nice addition to my collection of knives, swords, and daggers. Budk, you are the best. Good to see new items!